Hamas is not about to ever make peace with Israel, they say. They were founded in 1987, so they've been warring against Israel for the past 27 years. Since 2001 shelling has come from Gaza upon southern Israel. Hamas kicked out Fatah in 2007. Fatah, on the other hand, was the PLO, Arafat's terrorists, and they've been at it for the past 65 years one way or another. The one way right now it not to recognize Israel as a Jewish state. The PLO started in 1964 and their ideology is that "armed struggle is the only way to liberate Palestine. They see the partition in 1947 which wasn't accepted by them as something illegal (not accepting the UN decision of creating 2 states). They then think creating Israel was an illegal act. They disbelieve the Jews claims of historical or religious ties with the land. This comes out of their PLO charter of 1968. Kerry should have read their charter first, and he would have known the stand they would inevitably take. The goals of both, as they've shown by teaming up together on many occasions, is to drive Israel into the sea. Terrorists have been shooting at southern Israel since 2001 with rockets, usually Qassams, mortars and missiles. " Their main effect is their creation of widespread psychological trauma and disruption of daily life among the Israeli populace. Medical studies in Sderot, the Israeli city closest to the Gaza Strip, have documented a post-traumatic stress disorder incidence among young children of almost 50%, as well as high rates of depression and miscarriage." Hamas has dug many tunnels in Gaza to bring in weaponry or supplies to make weapons. The Egyptian war has hurt them since they have destroyed hundred of these smuggling tunnels along the border between Gaza and Egypt. Egyptian security measures include measures against Hamas. Ismail Haniyeh, the Hamas Prime Minister, spoke to a crowd at a mass rally and told his people that the Egyptian war has harmed his movement. He's hoping that this rally will send a message to Israel and the PA and Egypt. He wants to tell Egypt that despite the ongoing Egyptian blockade of the Gaza Strip, Hamas will not weaken. On the 21st of March, a Friday, Israel found a tunnel that had gone for hundreds of yards into Israel. They were very glad they had found such a large a tunnel, so Hamas downplayed the discovery and remarked, Oh, this old tunnel? "“This tunnel was unsuitable for use,” said the spokesman, who was identified only as Abu Obaida. “This is not a new tunnel, and it was uncovered due to the rainstorm last week. The discovery was not an intelligence achievement, as the enemy tries to promote.” Ha! The Egyptians have accused Hamas of terrorist attacks inside Egypt, said Yusef Rizka, a Hamas representative. Rizka went on to say that Jihad in Palestine ( here he is calling Israel "Palestine") is not terrorism." " Jihad in Palestine is a sacred duty." 82% of dead and wounded were civilians between 2000 to 2004. Israel responded. "The military wing of the Palestinian Islamic Jihad, called the Al-Quds Brigade, claimed responsibility for firing dozens of missiles on what it called "Israeli settlements." Israel caught an Iranian ship on March 5 with missiles headed for Gaza and confiscated them. Afterwards, 60 missiles rained down on southern Israel from Gaza as punishment. They do have different moral and ethical standards than the rest of us. To attack women and children is terrorism to us. To them it's their moral duty. That may have been okay for people 4,000 years ago, but not today. Some of us have advanced. By 1,200 BCE, Moses brought to the 12 tribes of Jacob and other slaves that joined up with them a very moral code to follow; the Mosaic Law. We follow it to this day. Judaism equals morality and ethics. That's what it's all about. Left to man's imagination, we had the Holocaust. We had savage brutality on the "Road to Bataan", a death march. By 630 CE Mohammad gave a code similar to his people who became Muslims, didn't he? Wasn't he the 3rd and final teacher, he said? How can the Palestinian Arabs feel that killing helter-skelter other than warring against an army in battle is okay to do and is their moral duty? What they do is shoot into southern Israel helter-skelter, not knowing what they will hit. Only they know that what they are aiming at are homes with women and children, schools, etc and that's what they hope to kill. Unlike their own people who put their women and children in harm's way, Israelis have bomb shelters-that is-if they can get to them within the 3 minute warning. 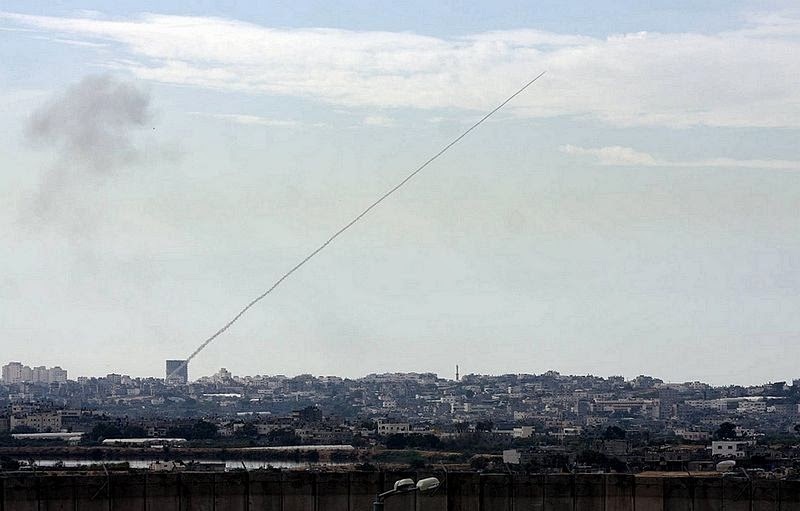 Since 2001 Hamas and other groups in Gaza have rained down rockets, mortars and missiles on southern Israel. By holding such a rally shows us that even if Abbas does a 180 degree turn around and signs an Israeli-Palestinian peace treaty, the Palestinians who took over Gaza will not stop plotting to destroying Israel. It's in their charter. If they ever rewrite their charter and take up ethical and moral goals, then of course peace would be on the horizon. Even Abbas knows that he would not live a minute more if he signed such a treaty because Hamas, who is also in Judah and Samaria, would do him in quickly. You cannot turn a missile into a plow just by looking and it and threatening it. So it's the same with people on a course of utter hatred and war, Fatah and Hamas.. Since the war will continue from Gaza most likely, some day the terrorists will just fall through their land from digging so many tunnels, I guess. Their only skill ever learned will be of digging tunnels. Anyone needing some tunnel diggers for a subway system they want to install? Gaza had been under Egyptian control before it came into Israel's hands in 1949. In May 1967 U Thant, the UN secretary-general, obeyed the demand by Nasser of Egypt to withdraw the UN force which led to events that started the Six-Day War of 1967. Israel won and Gaza was again under Israeli control. In 1967 there were 352,260 people in the Gaza Strip of whom 172,520 were refugees.